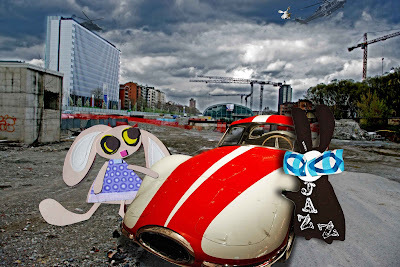 Lovely Lapinette looked at the Wabbit across Turbina the Jet Car and the Wabbit looked back at Lapinette. "Are you ready?" asked Lapinette. "I am," said the Wabbit. "Have you got everything?" said Lapinette. "I have," said the Wabbit. "Are you sure?" asked Lapinette. "Not any more," said the Wabbit. "Where's your list?" asked Lapinette. "In my other coat," moaned the Wabbit, looking sheepish. "Well, I do have a copy," said Lapinette. The Wabbit grinned. "You always have a copy!" he cheered. "Don't rely on it," said Lapinette. "Anyway, where's your salad sandwich in case you get hungry?" "In the salad crisper," said the Wabbit. "Turbina doesn't have salad crisper," said Lapinette. "I do now," said Turbina in a complaining voice. "I've never known anything get crisp in a salad crisper," said Lapinette. "It's an experiment," said the Wabbit. Lapinette covered her eyes with her paws and groaned. "I'm more worried about these helichoppers," said the Wabbit, "so I asked Ghost Bunny to torment them. The both looked up and caught sight of Ghost Bunny chasing a sinister black helichopper into a cloud. "The Agents of Rabit?" asked Lapinette." They're getting in my hair," said the Wabbit. "Think we can shake them off?" said Lapinette. 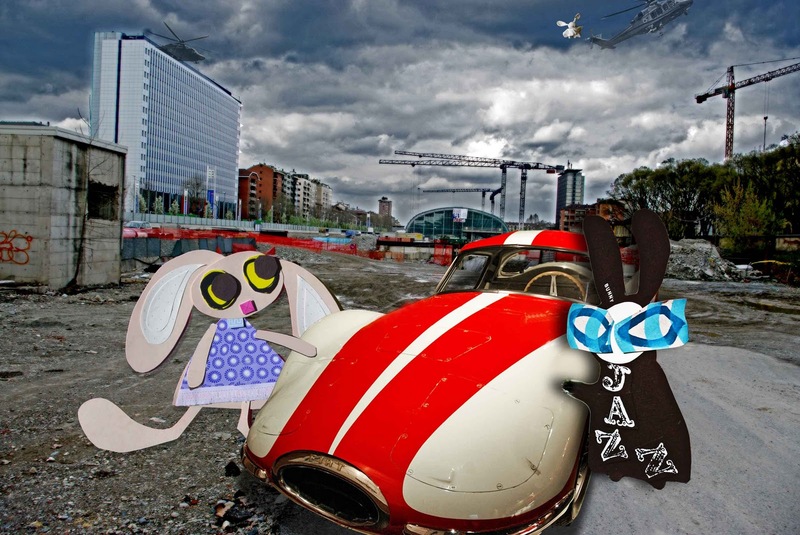 "At least we know where they are," said the Wabbit. "Behind the clouds?" said Lapinette. "I'll get Ghost Bunny to keep track of them and when we get to Rome, we'll lure them into a trap." said the Wabbit. "I'll have had a word with Cardinal Lapin," said Lapinette, "he's good at traps." "How good?" asked the Wabbit. "Firecrackers, duct tape and a toilet seat," said Lapinette. "I’ll put him on my list" said the Wabbit. "You forgot your list," said Lapinette.